Turn your Android smartphone into a 360° camera with the Insta360 Air. This lightweight and compact spherical camera connects to your device via USB Type-C. Once attached, it can capture 360° images and video. You can stream these images instantly or save them for later using the free Insta360 Air app and Insta360 Player. You can even switch to VR mode and use a VR headset (sold separately) to create a truly immersive experience. Beyond sharing experiences, the Insta360 can function as webcam for video conferencing using services like Skype or other meeting software. The Insta360 Air features dual 210° fish-eye lenses and is capable of capturing 3K images and 2K video (3K video capture is available with certain Android devices). The Air utilizes real-time stitching, allowing you to stream your content instantly. It supports most live-streaming and sharing platforms, including Facebook, YouTube, Twitter, WhatsApp, WeChat, Skype, and more. 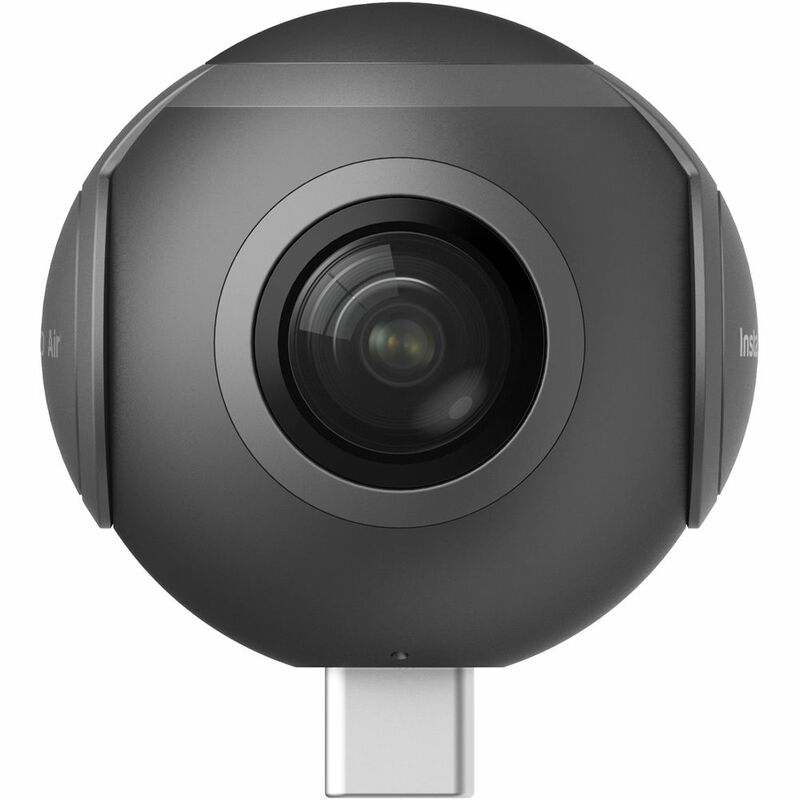 Featuring dual 210° fish-eye lenses and real-time image stitching, the Insta360 Air capture spherical images, so nothing and no one is out of shot. The camera outputs 3K stills and 2K videos (3K-ready with select Android smartphones). Live stream all your 360-degree content to compatible platforms, such as YouTube, Facebook, Twitter, YouTube, WhatsApp, and more. The Insta360 Air's built-in advanced stabilization algorithm increases precision and makes it easy for everyone to capture smooth panoramic shots. The Insta360 Air can also be used as a 360° webcam when connected to laptops. The Insta360 Air is simple to use. Once connected to an Android device, the app automatically activates. The app also features image- and video-editing tools so that users can create content specific to their tastes. The compact Air camera is lightweight and ultra-portable. Box Dimensions (LxWxH) 3.8 x 3.7 x 2.75"
Air Camera for Android Devices (USB Type-C) is rated 4.2 out of 5 by 11. Rated 4 out of 5 by Joseph from Fantastic as long as you're aware of the limitations I own this, the LG 360, the Gear 360, and the Theta S. All have their pros and cons, and (spoiler alert) my favorite overall, especially when taking price into account, remains the LG 360. That being said, this adds some very cool functionality and comes at a reasonable price. As you can see in my pictures, this is small - even on its stand/holder, it's dwarfed by the Samsung Gear 360. You actually can put it in your pocket (in the holder), although it's not super comfortable... but at least you *can*, unlike the Gear 360. The holder (silicone) is actually well designed and protective. This is much easier to handle without touching the lenses than the Gear 360 (which Im using for comparison since its of the same form factor), although the Theta S and LG 360 remain the easiest to use without accidental lens touching. Resolution and image quality are... adequate. Even on my Pixel XL, I was only getting2560 x 1280 video, so the partial support for3008x1504 must be for a very select set of phones. Quality is good in terms of color, but the images and video tend to get really blown out by bright lights, more so that other 360s, and the lens quality isn't as good as that of the others I own. Then again, you're not buying this for quality (which, again, is fine, just not exceptional) - you're buying it for quick (even live) access to video. That's where this shines - quick/live video access. Because it's mounted on your phone, transfer between the app and your main storage (e.g., Google Photos) is very fast. Photo transfer on any of the lower-end 360s is fine, but videos tend to take *forever*. Not on this. It's not instant, but it's a small fraction of the video time, unlike a multiple of it as with all the others. As a result, you can take and then share video almost immediately without first needing the long, tedious, disconnection-prone process youd have with other cameras. Likewise, you can share to Instagram, Facebook, YouTube, etc very quickly. The real winner here is live streaming, and its arguably the only truly legitimate reason to get this. Ive tested it with YouTube and it works. 1280p/6mbit video livestreams without issue as long as your network allows it. I did it over WiFi and LTE - both worked. You can lower the resolution and bitrate to suit your connection. Its very very cool, assuming you have some reason to livestream 360 video. I dont, not really, but I wanted to try out this camera anyway. This comes with an extension cable thats semi-rigid and is meant for computer use (Windows app now, Mac one coming soon), but I found that, with an adapter, it works in my Pixel XL and allows me to use the camera when the case is on my phone, but I fear the cable-induced movement isnt good for the phones USB C port. There are some notable cons: * image/video resolution and quality will be beaten by the other 360s, including the LG 360 which is of similar cost. * you cannot charge your phone while using this without some complex setup; it uses the only port your phone has * you're limited to your phone's storage (except when livestreaming), and because of how this works, it first stores in one format, then can be shared to a standard one, so everything takes up twice the space until you clean up * you cant use this without it attached to your phone, so using it on, say, amusement park rides ups the ante for possible loss * it wont plug into your phone if its in most types of phone cases, so consider that * the software works but can be a bit flaky; you might need to stop it, then plug the camera back in That being said, this does the job and is fun to use. It has limitations, but the livestreaming is a killer feature, and it works. Rated 5 out of 5 by Alfredo from Definitely worth the buy! I am pretty content with my purchase of the Insta360 Air for Android. Although resolution isn't the greatest, it's perfectly understandable due to it being so portable and just so flexible to work with. However, it's a lot better than I expected! It's not a battery killer either, which in my opinion is very important if you plan on broadcasting live on facebook! Which is another super cool perk about having this gadget! I mean, how cool is it to be able to let your friends see the world through your eyes in 360?? and in real time? It's awesome! Rated 4 out of 5 by PhotoSteve from Great little 360 cam The camera is really nice and convenient to carry around. The quality is surprisingly amazing for such a little camera at this price point (I have a vuze cam as well and the insta360 takes FAR better photos - kinda ridiculous considering the difference in prices). The auto animation features built into the app are fun. The only con I can think of is that it's not as easy to upload directly to social media - they want to do so through their insta360 cloud service rather than just directly exporting to social media like other photo apps. Rated 5 out of 5 by Tiago Ramos from Great gadget for pictures and amazing videos I have a Lenovo Moto Z, so I bought the USB Type-C model. Although it has several bugs, I could take amazing pictures and videos, and post it on Facebook. Instagram is not able to complete view 360 pictures and videos, but Facebook is able, and my smartphone also can open the videos and pictures. Rated 3 out of 5 by Daniel from If you have more money,I recommend looking for another model Considering the price and compared to competitors is a good way to get started with the 360 cameras. Her hardware is a bit bad and continually crashes when connected to the phone, causing you to take it out and put it back on the cell phone constantly. The quality of the pictures could be a little better and this leaves something to be desired. If you have more money, I recommend looking for another model. Rated 2 out of 5 by Val from doesn't work for Nexus 5X tried almost all possibilities to work but still no luck.? the only luck I have is I returned with full refund.? bye-bye. Can it be used with Zen tablet android? Not really sure. Try installing instaAir 360 application from Google Play. It may work. Does anyone know which phones lets you shoot in 3k? Once I receive my shippment I can answer this question.I am waiting for this for 27 days. Answered by: jaya prakash v.